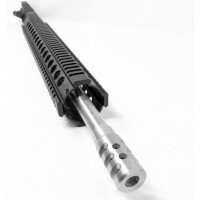 .450 Bushmaster Barrel is a great option for any AR build! These barrels are precision machined from a 4150 Mil-Spec steel blank with a 1:24 twist. It is double stress relieved before rifling and thermally stress relieved after to ensure the best possible accuracy and performance. Precision machining and production ensure the correct component interface. These standards ensure the highest quality and longest life from your new barrel. Guarantee 1MOA groups at 100 yards when observing proper shooting techniques and using high quality ammunition. 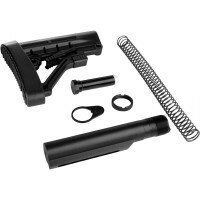 AR-15 .450 Bushmaster 10" "Thumper" Pistol Upper Assembly - Just add this .450 Pistol Flattop Upper to your AR15 Pistol Lower Receiver, and you are ready for the range. This assembly includes 10" heavy profile .450 Bushmaster barrel with slim 10" free-float handguard, available in your ch..
AR-15 .450 Bushmaster 10" Pistol Upper Assembly - Just add this .450 Pistol Flattop Upper to your AR15 Pistol Lower Receiver, and you are ready for the range. This assembly includes 10" heavy profile .450 Bushmaster barrel with slim 12" free-float handguard, available in your choice of ke..
AR-15 .450 Bushmaster 12" Pistol Upper Assembly - Just add this .450 Pistol Flattop Upper to your AR15 Pistol Lower Receiver, and you are ready for the range. This assembly includes 12" heavy profile .450 Bushmaster barrel with slim 12" free-float handguard, available in your choice of ke..
AR-15 .450 Bushmaster 12" Pistol Upper Assembly w/KAK Flash - Just add this .450 Pistol Flattop Upper to your AR15 Pistol Lower Receiver, and you are ready for the range. This assembly includes 12" heavy profile .450 Bushmaster barrel with slim 12" free-float handguard, available in ..
AR-15 .450 Bushmaster 16" steel black nitride upper assembly, This drop-in .450 Bushmaster upper will attach to virtually any standard AR-15 lower assembly. 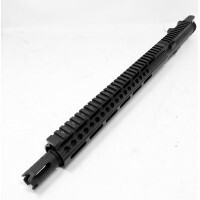 Available in 4150 Steel Black Nitride Finish, with 1 and 24" twist and rifle length slim keymod free float handguards. 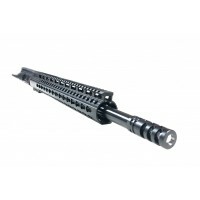 ..
AR-15 .450 Bushmaster 18" steel black nitride upper assembly, This drop-in .450 Bushmaster upper will attach to virtually any standard AR-15 lower assembly. 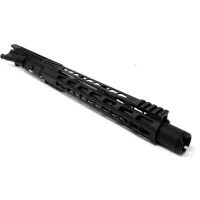 Available in 4150 Steel Black Nitride Finish, with 1 and 24" twist and rifle length slim keymod free float handguards. ..
MORIARTI .450 BUSHMASTER "THUMPER" PISTOL W/ SHOCKWAVE BLADE Made to mil-spec standards. Must be shipped to FFL. 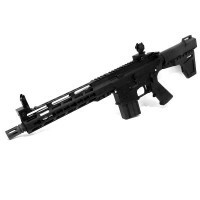 • Weight: 6.0 lbs• Finish: Anodized Black• Action: Semi-auto ..